This title was first published in 2001. This book is the result of an international study by leading economists and sociologists from across Europe and North America. The response of the new social economy (primarily voluntary and co-operative sectors) to social exclusion and employability in the context of crises of unemployment and the welfare state is of wide international concern. This book looks specifically at the growth of enterprises and initiatives whose primary aim is the integration of unemployed and disadvantaged people into work. A common framework has been used in each of the country studies, thus allowing an interesting international comparative perspective to be developed. There is considerable interest in how the third sector is changing internationally in response to rapidly changing work and welfare systems. 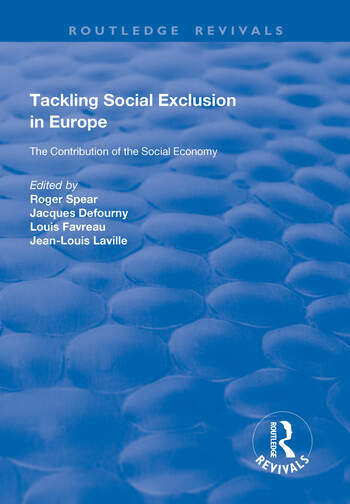 By distilling international experience this book makes an important contribution to debates about new ways of addressing the central issues of unemployment and social exclusion of disadvantaged people in society. Contents: Introduction: Introduction to an international evaluation, Jacques Defourny, Louis Favreau and Jean-Louis Laville. Work Integration and the New Social Economy in Ten Industrialized Countries: Austria: recent employment initiatives within a strong tradition of public action, Peter Ulrich Lehner; Belgium: voluntary organizations and integration through work in Francophone Belgium, Jaques Defourny, Marthe Nyssens and Michel Simon; Canada: social mobilization, insertion and local development in Canada (Québec), Louis Favreau; Finland: voluntary organizations and co-operatives for socio-economic reintegration in Finland, Pekka Pattiniemi, Harri Kostilainen and Marianne Nylund; France: voluntary sector initiatives for work integration, Danièle Demoustier; Germany: work integration through employment and training companies in Berlin and its surrounding region, Karl Birkholzer and Gunther Lorenz; Italy: the impressive development of social co-operatives in Italy, Carlo Borzaga; Spain: a new social economy still inadequately known and recognized, Isabel Vidal; Sweden: co-operative development agencies as a means of bridging recent failures of the system, Yohanan Stryjan and Filip Wijkstrom; United Kingdom: labour market integration and employment creation, Roger Spear. Theoretical Issues: The specific role of non-profit organizations in the integration of disadvantaged people: insights from an economic analysis, Carlo Borzaga, Benedetto Gui and Fabrizio Povinelli; Third sector and social economy re-examined in the light of initiatives promoting insertion, Jean-Louis Laville; Legitimate orders of social participation and the logic of social change, Bernard Eme. Conclusion: New directions in a pluralist economy, Jacques Defourny, Louis Favreau and Jean-Louis Laville; Index.